Southeast Iowa, once a well kept secret is rapidly becoming recognized as one of the premiere trophy whitetail deer hunting areas anywhere. Turkeys are also plentiful. Brian Lindberg grew up hunting this area’s rolling hills, creek bottoms, hardwoods, marshes and farm fields. He began selectively outfitting several years back. Brian runs a successful insurance agency and that has given him exposure to some of the area’s best country. Soap Creek isn’t a high volume commercial operation, because Brian believes that large numbers of hunters and quality hunting just don’t mix. Trophy whitetails especially, simply won’t take that kind of pressure. 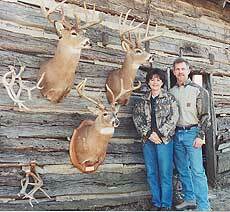 Soap Creek hunts are best described as semi-guided. They have tree stands positioned. Brian has the ranch house, cabin, and new lodge. Hunts are available with or without lodging. Hunters are responsible for meals, either cooking in the cabins or eating in local restaurants. The cabins are also available for rent during non-hunting seasons. Contact Soap Creek for details. Thanks for your interest in hunting with Soap Creek Outfitters. Come see what Iowa hunting is all about. The last of the hunters just headed home. Percentage wise three of out four bow hunters took bucks home. Four of the four 2nd season shotgun hunters took bucks home. The year was going great until the 2nd shotgun season when the weather turned warm. Deer movement was strictly at night. One of the four hunters took bucks home. What I felt was going to be a disaster of a late muzzleloader season turned into deer moving all over the area. I feel that this is due to pressure from the surrounding areas that are being hunted. We average 10 hunters per year so they do not feel the pressure here. Bucks were losing their antlers early but we still saw a couple of the 150’s and 160’s during the day. We still have an abundance of turkey if you are interested in a turkey hunt. 2015 turned into a great year for Iowa deer hunting and Soap Creek Outfitters. The deer we have seen while hunting as well as on the cameras will set up 2016 as a banner year. We are fortunate in the fact that we have been doing this so long that we don't have to take many hunters. We still believe that a lot of hunters and quality deer do not mix. We only took eight hunters in 2015 which was due to the draw in Iowa. In the past few years we have taken 15 to 17 hunters each year. If hunting Iowa from another state remember Iowa is different. If you want to improve your chances of killing a quality buck you must do three things, get out of the lodge, stay in your stand and listen to the outfitter. Sounds simple but most guys will not do it. 2014 wrap up for Soap Creek Outfitters. After the EHD went through the Midwest states in 2013 as well as our area I hesitated to bring in too many hunters for 2014. After having eight cameras going and capturing several great bucks I was wishing I had encouraged the bow hunters more to hunt this year. The deer have really rebounded with the perfect spring and summer we had. With all the great bucks on the cameras I feel like 2015 and 2016 will be back to what we had in the past. The deer numbers are still down due to the EHD but that is the way Mother Nature is. We had a great growing season in 2014 and the deer are healthy. I have seen a couple of 180 class bucks taken in the area for 2014. Right now most dates are open and I suggest you get on board because the bucks have come back. Largest buck taken with us for 2012.